A New and Accurate Map of Scotland from the latest Surveys. 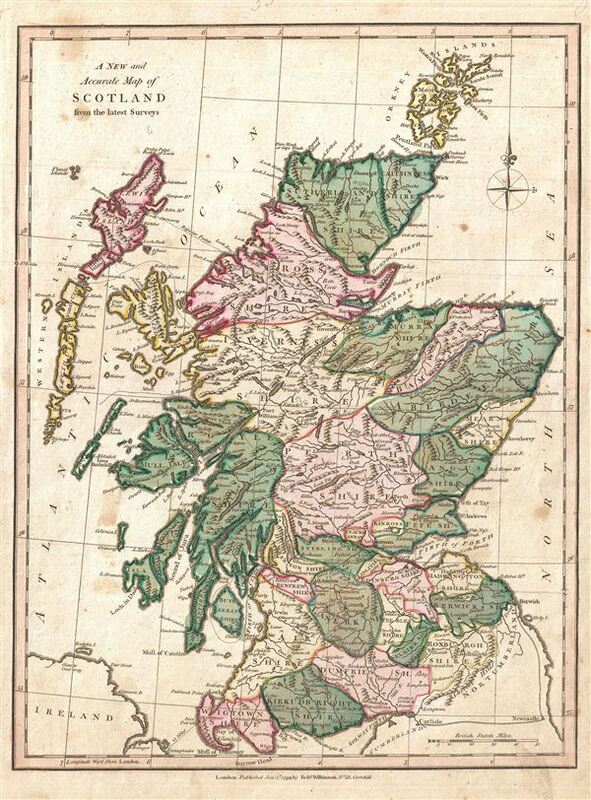 A finely detailed first edition 1794 map of Scotland by Robert Wilkinson. Wilkinson's map covers Scotland in full from the Cheviot Hills to the Orkney Island and from the Outer Hebrides (Western Islands) to Aberdeenshire. Color coding divides the region into various shires with roads, lochs, cities, and rivers noted. engraved by Thomas Condar for the 1794 first edition of Robert Wilkinson's General Atlas. Robert Wilkinson (fl. c. 1768 - 1825) was a London based map and atlas publisher active in the late 18th and early 19th centuries. Most of Wilkinson's maps were derived from the earlier work of John Bowles, one of the preeminent English map publishers of the 18th century. Wilkinson's acquired the Bowles map plate library following the cartographer's death in 1779. Wilkinson updated and tooled the Bowles plates over several years until, in 1794, he issued his fully original atlas, The General Atlas of the World. This popular atlas was profitably reissued in numerous editions until about 1825 when Wilkinson died. In the course of his nearly 45 years in the map trade, Wilkinson issued also published numerous independently issued large format wall, case, and folding maps. Wilkinson's core cartographic corpus includes Bowen and Kitchin's Large English Atlas (1785), Speer's West Indies (1796), Atlas Classica (1797), and the General Atlas of the World (1794, 1802, and 1809), as well as independent issue maps of New Holland (1820), and North America ( 1823). Wilkinson's offices were based at no. 58 Cornhill, London form 1792 to 1816, following which he relocated to 125 Frenchurch Street, also in London, where he remained until 1823. Following his 1825 death, Wilkinson's business and map plates were acquired by William Darton, an innovative map publisher who reissued the General Atlas with his own imprint well into the 19th century. Thomas Conder (1747 - June 1831) was an English map engraver and bookseller active in London during the late 17th and early 18th centuries. From his shop at 30 Bucklersbury, London, Conder produced a large corpus of maps and charts, usually in conjunction with other publishers of his day, including Wilkinson, Moore, Kitchin, and Walpole. Unfortunately few biographical facts regarding Conder's life have survived. Thomas Conder was succeeded by his son Josiah Conder who, despite being severely blinded by smallpox, followed in his father's footsteps as a bookseller and author of some renown. Wilkinson, R., A General Atlas being A Collection of Maps of the World and Quarters the Principal Empires, Kingdoms, and C. with their several Provinces, and other Subdivisions Correctly Delineated., (London) 1794 First Edition. Very good. Minor marginal soiling. Original platemark visible. Blank on verso.